“Building an Inter-American Education Agenda: Education with Equity for Prosperity"
Representatives of Ministries of Education from 27 OAS member states committed to building an Inter-American Education Agenda to guide Inter-American cooperation in three areas: Quality, Equity, and Inclusion in Education; Strengthening Teacher Professional Development, and Comprehensive Early Childhood Care. The construction process will be led by the Ministers of Education through Working Groups and will be supported by the implementation of a Virtual Platform for Educational Cooperation in the Americas. The meeting began with an initial reflection on educational policies and innovation, by Dr. Fernando Reimers (Harvard University), and continued with panels featuring the Ministers of Education on the priority working areas of the Agenda. Also for the first time in this policy dialogue instance, employment-sector participation was included, which initiated articulations to achieve regular meetings between the Ministers of Education and Labor. 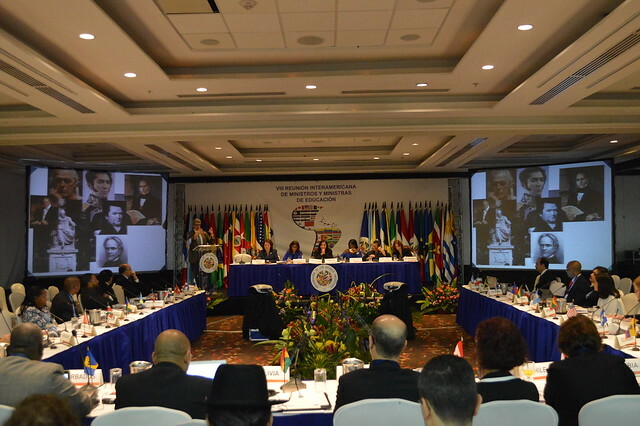 Twenty-seven Member States representatives attended the Ministerial Meeting, including: Ministers of Education, Deputy Ministers, Chief Advisors, Senior Officials from Bureaus of Education, Permanent Representatives to the OAS, and Ambassadors of other countries in Panama headed these delegations. Panama’s Minister of Labor Development and Mexico’s Deputy Minister of Labor and Social Security represented the employment sector. Civil society organizations, and representatives from international and regional groups also attended as invited observers. 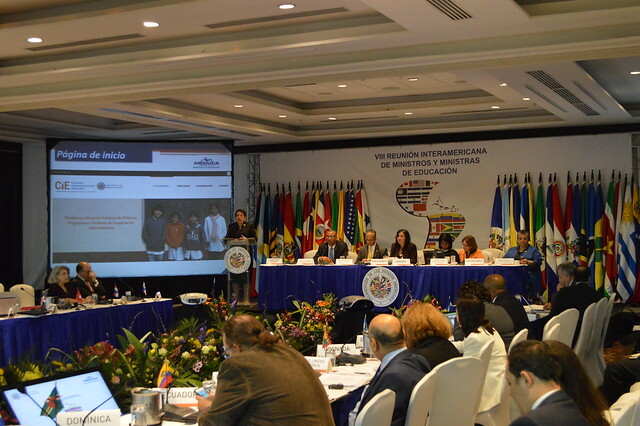 The Virtual Platform for Educational Cooperation in the Americas, was launched by the Minister of Education of Panama, Marcela Paredes de Vázquez, as her first initiative as Chair of the Inter-American Committee on Education; with the purpose aiding the construction of the Inter-American Educational Agenda by facilitating the dissemination of educational solutions developed by different countries used to meet their major educational challenges, and improve communication and flow of information between Member States in this field. The main functions of this platform will be to collect, organize, disseminate, highlight, and create awareness about policy practices, and educational programs and initiatives that are prioritized by Member States. Please click here to access the form to collect practices. 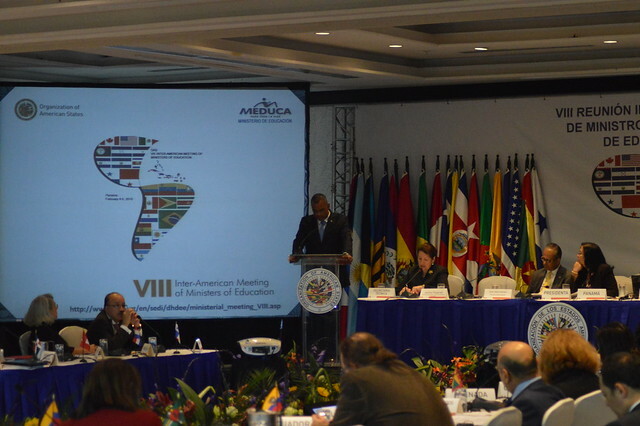 In addition, the Summit resulted in the composition of an Executive Board for the Inter-American Committee for Education, which was almost entirely completed, leaving only vacancies for Principal and Alternate Delegates in the Southern Cone. To learn about the authorities and members of the Executive Board please click here. 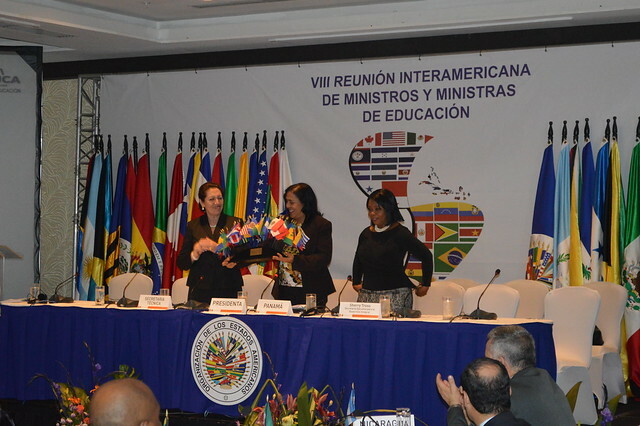 During the meeting, and with much gratitude and enthusiasm from all delegations, The Bahamas was nominated as the next host for the IX Summit of Ministers of Education. The present Member States also adopted the Resolution "Vote of Thanks to the People and Government of the Republic of Panama," which reflects the special congratulations and deep gratitude to Panama for a successful meeting led by the Minister Marcela Paredes de Vázquez.